Hard though it may be to believe, it’s been 20 years since we collectively decided to re-define the superhero movie. Tim Burton’s Batman was risky at the time, incorporating elements from the comic-book innovators of the mid-1980s to create a darker palette. Gone were the primary colors of Superman and the biff-pow-blammo campiness of the Batman television series. The costumed hero had shown a darker side—and we were more than OK with that. X-Men Origins: Wolverine arrives at an interesting moment in the history of the comic-book blockbuster. Christopher Nolan’s The Dark Knight last year raised the stakes with its quagmire of moral complexity, and the filmmakers here seem to be trying to learn some of its lessons. But after 107 minutes, it doesn’t appear that they learned enough of them. Screenwriters David Benioff and Skip Woods take us back to 1845 Canada, where a pair of young brothers with strange healing abilities—and extra-sharp retractable extremities—flee for their lives. For the next 100-plus years, James (Hugh Jackman) and Victor (Liev Schreiber) make use of their near-immortality as unstoppable soldiers, eventually landing in a Vietnam-era secret force of mutants led by Col. William Stryker (Danny Huston). But James rebels against the covert violence, and flees back to Canada, where—re-dubbing himself Logan—he tries to live a normal life with a woman named Kayla (Lynn Collins). “Tries,” of course, being the operative word. 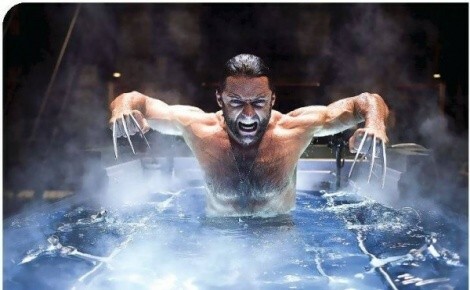 Much of the rest of the narrative becomes a straightforward revenge story, as Logan eventually consents to the experimental operation that will fuse the miracle metal adamantium to his bones and pop-out claws, turning him into Wolverine. That’s where director Gavin Hood (Tsotsi, Rendition) wants to anchor the emotional hook, and he certainly spends a fair amount of time establishing the relationship between Logan and Kayla to that end. They cuddle, they kiss, they tell pointedly allegorical myth-stories, all preparing us for the moment when Kayla is sacrificed as certainly as that war-movie kid with a picture of his girl back home. Only it never quite connects. No matter how much Jackman snarls, Logan never seems genuinely tormented in his grief. And it points out a unique challenge in this performance: Even though Jackman has played Wolverine in three X-Men features, this character isn’t the same guy. While Hood occasionally wants him to play the same cynical wisecracker, we’re mostly watching someone who should display a completely different psychological makeup. Good luck to you if you can figure out where the pre-amnesia Wolverine ends and where the guy who joined Charles Xavier begins. Jackman might have had better odds, too, had the film really committed to diving into its hero’s animal nature and the collision between his morality and that of Victor (a microcosm of the Professor Xavier/Magneto dichotomy from the other X-Men films). Instead, it also wants to wallow in geek-gasm moments for its primary fan base. That means piling on the cameo appearances by familiar names from the Marvel Comics universe like Deadpool (Ryan Reynolds, offering a few sparks of energy), Gambit (Taylor Kitsch), Blob (Kevin Durand) and a host of pre-School for Gifted Youngsters mutants, including an adolescent Scott Summers/Cyclops (Tim Pocock). The super-powered action kicks into high gear for plenty of set pieces, but it’s so over-stuffed that too little of it matters. And that’s where Wolverine misses the point of harder-edged comic-book fare. The Dark Knight didn’t work because it was dark; it worked because it was focused on the character dilemmas that would make the story matter. Spider-Man and Spider-Man 2 weren’t “dark,” but Peter Parker’s plight resonated—until Spider-Man 3 forgot about that and tried to cram in too much superfluous stuff. The furious, claw-slashing violence here doesn’t add up to a truly gripping story, because it keeps zipping from place to place and adding a new character every seven to 10 minutes. It’s a clever and never-underlined touch to set the climax at Three Mile Island, the upshot being that the 1979 meltdown story might have been a cover for mutant mayhem. If Wolverine had been the kind of movie where fun was the order of the day, it might have been a perfect cherry on top. Instead, it goes for the darkness without providing the emotion. The Dark Knight’s Joker asked, “Why so serious?” I’m not convinced the filmmakers here know the answer.